The figure of St. John the Forerunner looms large in the Gospels and the Acts of the Apostles, even long after his death had been recorded. This reflects his great historical importance in 1st century Judea, as reflected in the writings of Josephus amongst other places. His coming as the forerunner of the Messiah was prophesied within the Hebrew scriptures and the return of the Prophet Elijah, St. Elias, was one of the markers of the coming of the expected Christ well-known to Jewish communities of the era. This prominence is reflected in the Orthodox iconographic tradition in which he stands at the left hand of Christ enthroned. He serves as the link between the Old Testament prophets and the New Testament saints. Despite all of this, basic aspects of his identity, his way of life, and his mission are little investigated in the scriptures, and therefore not well-known or understood. St. John’s life is frequently described as being ‘angelic.’ He is an ‘angelic man.’ He is frequently depicted in iconography with large wings, the typical iconographic mark of an angel or archangel. Traditionally, after he and his mother, St. Elizabeth, fled into the desert following the murder of his father, St. John was cared for and raised to adulthood by angels (Luke 1:80). These angelic connections are variously parsed, but often understood in a shallow way to just indicate that St. John was somehow like an angel in his way of life, usually centering around his celibacy and fasting, which is then connected to these ascetic elements of the monastic life. St. John’s life, however, was a continuation of the prophetic way of life, and many prophets were married, with their waives receiving the title of ‘prophetess’ based on that union (cf. Is 8:3-4). St. John’s angelic life is conveying something far deeper about the nature of the life of the prophets of the Old Covenant and the saints of the New. In the context of the contest between the prophet Jeremiah and the false prophets, Yahweh the God of Israel gives a paradigmatic criteria for a true prophet: That that prophet has stood in God’s divine council and heard its deliberations and is serving as its messenger to the earth (Jer 23:18-22). This is the pattern seen in the prophetic call of Isaiah as he begins his ministry (Is 6:1-13). Humanity belongs to both elements of creation, the visible and the invisible, and was created to live in and bridge both before sin obscured humanity’s ability to perceive the spiritual realm. The gift of the prophets of the Old Covenant and many of the saints of the New is, through the purification of their spiritual senses, they are given to live in both and serve as a messenger (the same word as ‘angel’ in Hebrew, Aramaic, and Greek) of the invisible to the visible. When Elisha’s servant sees the heavenly host arrayed to protect the prophet from the armies of Syria, he is being granted to see what the prophet already clearly saw (2 Kgs/4 Kgdms 6:15-17). The angelic associations surrounding St. John the Forerunner reflect his participation in the life of the invisible creation, the spiritual realm, from which he was commissioned to begin his ministry of baptism and to identify Jesus as the Christ (Jn 1:29-34). This angelic life is the key to understanding the connection between St. John and the prophet Elijah. As discussed in a previous post, at the end of his earthly life, St. Elias was taken up to join God’s divine council. Christ took counsel with Elijah and the prophet Moses, who had also been taken into the divine council at his death atop Mt. Tabor at the Transfiguration. By the first century, it was a firmly embedded part of Second Temple Jewish tradition that Elijah would return before the coming of the Messiah and the day of the Lord. This is directly prophesied by the prophet Malachi (3:1; 4:5-6). Though the emphasis on Messianism has faded from Rabbinic Judaism, even in contemporary Jewish practice a seat is left open at the Passover meal for the prophet Elijah should he choose that night to return. St. John the Forerunner is clearly presented by the Gospel writers as the fulfillment of this prophecy. This begins at the level of appearance (compare 2 Kgs/4 Kgdms 1:8 and Matt 3:4). More directly, Christ twice identifies St. John as the Elijah who was to come before him (Matt 11:7-15; 17:10-13/Mk 9:11-13). On the other hand, in St. John’s Gospel, when directly questioned as to whether he is Elijah or ‘the prophet’, St. John the Forerunner responds that he is not (Jn 1:19-22). Somewhere in between lies the prophecy concerning St. John received by his father, that he would come ‘in the spirit and power of Elijah’ (Lk 1:13-17). The perceived ambiguity regarding the connection between the two prophets has led to suggestions as bizarre as that St. John was a ‘reincarnation’ of St. Elias. To understand correctly how St. John can both be and not be Elijah, the concept of heavenly patronage in Second Temple Judaism must first be understood. When Job has lost everything, his friend, Eliphaz, asks him, “To which of the holy ones will you turn?” (Job 5:1). The word here translated as ‘holy ones’ is typically translated in the New Testament as ‘saints.’ In the context of Job, however, and much of the rest of the Old Testament, this term is used to refer to the angelic beings of the divine council. Eliphaz’s question therefore presumes that angelic beings play an intercessory role before the throne of God. Later in the book of Job, Job himself indicates that he has such a representative referred to as his ‘witness’ (Job 16:18-22). This understanding becomes the basis for what are today called ‘guardian angels’, angelic patrons who represent righteous individuals in the council of God. This tradition is directly referred to by Christ himself in Matthew 18:10. Through Christ, resurrected human persons are now likewise members of the divine council and fulfill this same role (Heb 11:39-12:2; Rev 4:9-11; 6:9-11; 8:4). As St. Elias is taken up in his fiery throne-chariot, he performs his first action as a member of the divine council, which is passing on his prophetic role and ability to his disciple Elisha. This takes the form of Elisha requesting, and receiving, a ‘double amount of his spirit’ (2 Kgs/4Kgdms 2:9). Elisha receives this request from Elijah and it is manifested at the Jordan near Jericho, the place of the beginning of Joshua’s conquest (Josh 3:15-17). Afterwards, the one of the communities of prophets, the forerunners of monastic communities in the New Covenant, recognizes that ‘the spirit of Elijah rests upon Elisha (2Kgs/4Kgdms 2:15). Elijah commissions and is the heavenly patron of Elisha, whom he has known personally. Likewise, St. John the Forerunner, who has been privy to the divine council knows St. Elias who has sent him forth under his patronage to continue his prophetic mission. 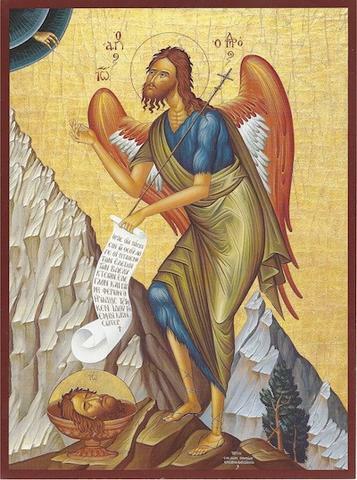 St. John therefore is the Elijah who was to come in being his representative, but is not in that he is a different human person who comes in St. Elias’ spirit and power. Finally, St. John’s mission as the forerunner of Christ was not only to identify him before the multitudes, but also to ‘prepare his way.’ This is not merely a vague statement that St. John’s ministry began first in time, but referred to something very particular. The great promise of all of the Old Testament prophets was that the exile which Israel had been forced to endure would one day come to an end. At one level, the Babylonian exile had ended under Cyrus when the tribes of Judah and Benjamin and portions of Levi were allowed to return to the province of Judea at the end of the 6th century BC. This return of a group of exiles was not the promise of the prophets, however. Many of the members of these tribes had not returned, but remained in Babylon or in Egypt. Further, however, the promises of the prophets were regarding the restoration of the entire nation, all 12 tribes, 10 of which had been dispersed by the Assyrians among the nations with seemingly little hope of return. Most pointedly, however, the promise that Yahweh, the God of Israel would return to Zion, to his temple, had not been fulfilled. The dedication of the second temple had been accompanied by none of the signs of God’s presence that had accompanied the dedications of the tabernacle or that of Solomon. Malachi’s promise of the coming of Elijah had promised precisely this (3:1). St. John’s rhetoric regarding the coming of judgment and of fire that will consume all of Israel if they do not repent mirrors Malachi’s language regarding his mission directly (4:5-6). The Old Testament prophecy most associated with St. John and his ministry is Isaiah 40:3 (cf. Matt 3:1-3; Mark 1:2-4; Luke 3:2-6; Jn 1:23). In the last of these references, St. John identifies himself with the voice crying, “In the wilderness prepare the way of the Lord.” The citation is of the beginning of a prophecy, but identifies St. John’s mission with the prophecy as a whole. Isaiah in 40:3-31 prophesies the end of the exile, when Yahweh, the God of Israel will himself return to defeat his enemies and lead Israel back into the land where he will dwell with them. The reconstituted Israel whom Yahweh will reclaim as his people begins with a remnant which is purified by and survives God’s judgment at the day of the Lord (cf. Mic 2:12; Jer 23:3; Joel 3:5; Obad 17; Is 6:13; 7:3; 10:22). The mission of Elijah, according to Malachi (4:5-6) is precisely to gather this remnant and prepare it for the Lord when he comes. This mission is entrusted to St. Elias based on his interaction with God in 1 Kings/3 Kingdoms 19:9-18 which immediately preceded the calling of Elisha. St. John the Forerunner fulfills his mission by purifying a repentant people, a faithful remnant of Israel at the shore of the Jordan. When the Lord comes to the Jordan to be baptized and begin his mission of conquest (see last week’s post), St. John gives to him this people, to form the basis of the reconstituted Israel who will receive God’s New Covenant. His life exemplifies what human life was created to be in this world and the world to come. He functions as the summing up of the mission and message of the prophets who came before him both proclaiming the fulfillment of their prophetic word in Jesus Christ and accomplishing finally the mission for which they were all sent, the purification of a remnant of God’s people, Israel, through repentance and a return to faithful obedience to Israel’s God. Thank you for your posts. I cannot tell you what a rich treasure they are for me! My question is whether there is any significance to the fact that sometimes you refer to Elijah and sometimes St. Elias? Thank you for your kind words. St. Elias and Elijah are two names for the same person. I varied them up in the piece to make it less monotonous to read. There’s no more significance than that. Every time I read your blog or listen to your podcast it’s like a little explosion in my brain. Thanks? I think this “explosion” is not so uncommon when reading about prophesy and the life of the prophets. It is a unique “office” God has granted to mankind. Many people are drawn to the prophetic, but I think much of it is by their own will. At least that is what I have seen over the years. And so, I too am ‘taken’ by Fr. Stephen’s presentation here! It is fascinating to see the connections between St. John, Elijah, and Elisha, as well as through the words of Isaiah, Malachi and the others. And other things: the particular place of the Jordan. The concept of patron saints and guardian angels. The very real communion between us and those in the Divine Counsel, both parties being ‘in the Lord’, as He reveals that life is ‘on Earth as it is in Heaven’. There is no ‘here and there’, no boundaries, but all reality, all existence is in Him, everywhere. 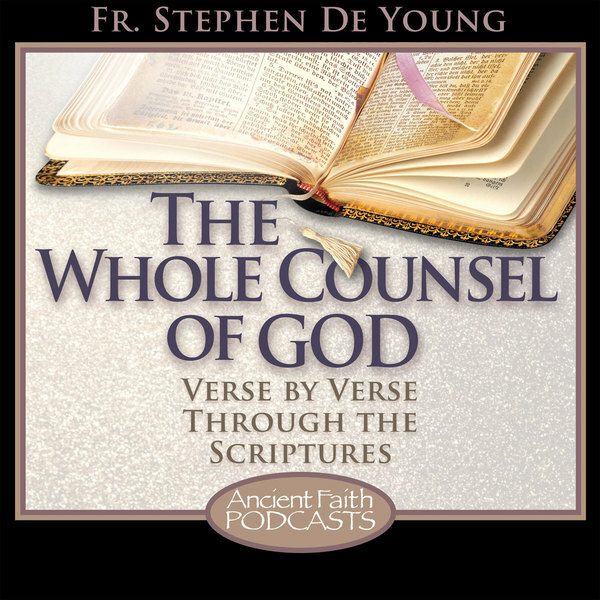 It is a delight to learn how the Church originally understood the words of scripture. In the past, I was taught that the ‘last days’ would be ushered in at the Second Coming. That is when Elijah and Moses would appear. Thus, St. John preparing the way of The Lord, Christ’s first Advent, was viewed instead as more of an historical event rather than as an intersecting of heaven and earth through the incarnation, life, ministry, passion and resurrection of the Son of God, *the* Messiah, spoken by the prophets long before. This linear and literal view prevents a ‘here now, but not yet’ concept so prevalent in Orthodoxy. Same with Father’s example of how St. John can both be and not be Elijah. It takes time to adjust to this type of thought! As for St. John coming in the spirit of Elijah, it was rather understood as he was “like” Elijah. The real communion between him and Elijah was not addressed. We did not recognize our communion with the Saints because we were taught all Christians are now saints. Just as the priesthood was not recognized because all of us are now the priesthood of believers. By declaring everyone a saint and a priest it leads to a dilution, and a dissolution, of the essence of both. Father, your teachings are a blessing! Thanks so much!